February is Pet Dental Health Month, and what better way to ensure your dogs dental health, than awarding them with a natural and safe chewie from Best Bully Sticks! We do our best to brush Venus and Ocean's teeth daily, but it's not just brushing that ensures good dental health, it's the use of their teeth and jaws, and the scraping they can do on their own to work away any buildup that a toothbrush may miss or be too soft for. That's where we include Best Bully Sticks products into their lives. 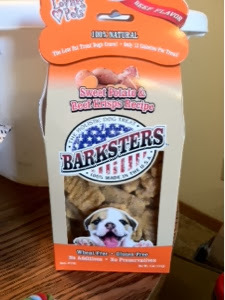 In honor of Pet Dental Health Month, Best Bully Sticks sent us a nice goody box to try out, including a bag of Yummy Yams Sweet Potato Dog Treats, a 6" standard odor free bully stick, a 6" thick odor free bully stick, a 12" standard odor free bully stick, a 12" thick odor free bully stick, and a 10" curly odor free bully stick. The girls were a little unsure of the Yummy Yams at first, but then Ocean fell in love with them. She hid hers in her bed and then proceeded to munch on Venus'. Venus and Ocean both love bully sticks, and Best Bully Sticks has our favorites! They start out hard, and turn softer as they are chewed, and rub against your dogs teeth as they chew, cleaning away while your dog enjoys a great snack. Venus loved the 10" curly bully stick best, but I think it's because it did have a stronger odor than the other bullies. Venus has loved bully sticks since she was a puppy, but we've never found such quality, natural, and mild odored as the ones we get from Best Bully Sticks. 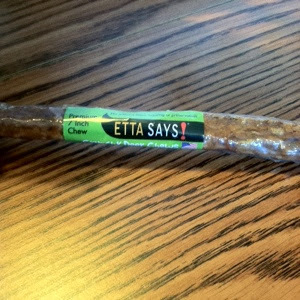 In honor of Pet Dental Health Month, and the every-day dental health of your pet, try Best Bully Sticks today! Make sure you follow them on Facebook to find great deals and discounts, and sign up for their money-saving newsletter on their website! You can also follow Best Bully Sticks on Pinterest, Twitter, YouTube, and Instagram. Pond's Luminous Finish BB+ Cream can be found in stores like Target and Walgreens for around $10. This bb cream comes in two shades, light and medium, and they are supposed to blend into your skin color from those two shades. I am wearing the light shade in this post. I have fair skin, but will also be trying the medium shade in a later post as well. Disclaimer: This blog received the product(s) mentioned in this post for the purpose of review and evaluation. No monetary compensation was received. All opinions expressed in this post are 100% my own. This post may contain affiliate links. Sally Hansen nail polishes can be found in stores like Target and Walgreens for as little as $2 for single bottles, up to $50 for kits (including gel polish). In this post I am wearing Sally Hansen Triple Shine nail polish in #330, Fanta-sea, over Sinful Colors Savage. Sinful Colors nail polish can be found in stores like Walgreens or Target for about $2 per bottle. In this post I am wearing Sinful Colors #950, Savage. It is a matte color of theirs. Rimmel London Stay Matte Primer; found in stores like Target or Walgreens for about $7. I was new to the world of make-up primers when I received this product. I had no idea what I was missing. This primer really does help my face stay looking and feeling matte for a majority of the day. Being a mom, I don't have a night life, and don't need my make-up to last all day and into the night. This primer minimizes the appearance of pores and and keeps you shine free for 8 hours. I usually wear my make-up for about 10-12 hours a day on my longest days out of the house for nursing classes, and I have no problems with shine or "melting." 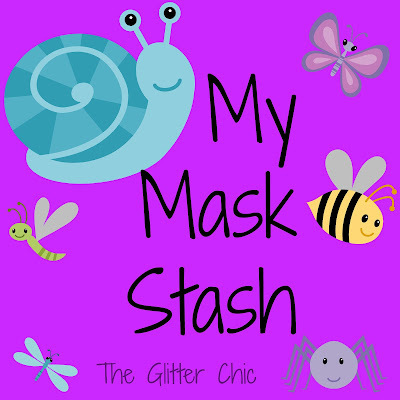 This primer has created a perfect canvas for my make-up and has kept my oily nose under control. Found in February's Ipsy Glam Bag. J.Cat Beauty Eyelashes with glue, model # EL66; $3.99. This is the first I ever tried to use false lashes. I've always been a heavy mascara girl, myself, but I was very excited to try them out once I saw pictures online of how they could look. Unfortunately, I was disappointed. I tried them a few mornings in a row and just couldn't get it down. I tried to apply them a couple different ways, but I just felt like they stuck together too easy. They are made of 100% natural human hair, but they definitely feel like plastic- like thin black fishing line actually. I'm really sad that these seem so cruddy. I've heard good things about a few other specific brands, so I think I'll try another brand in the future, I really wanted these to work! Pacifica Body Butter in Hawaiian Ruby Guava, $7 for 2.5 oz tube. Not as thick as I would expect from a body butter. I'm used to think creamy tubs of "butter" that are super thick, but this is just like a thicker lotion. Works very nice in the purse. Does not feel greasy or oily. I'm not exactly sure what guava should small like but this smells more like a floral mix with cherries. Zoya nail polish in Odette; $9. Very smooth color, I enjoy having something without metallics or glitter in it once and a while. I also love the shine of this polish. I did use a top coat, but it was actually almost more shiny before I put on the top coat. Very nice purple, not too bright, not too dark. The Make-A-Wish Foundation grants the wishes of children with life-threatening medical conditions to enrich the human experience with hope, strength, and joy. Kids say wishes them renewed strength to fight their illnesses, and their parents say these experiences help strengthen the entire family. Based in Phoenix AZ, Make-A-Wish is one the world's leading children's charities, serving children in every community in the United States and its territories. With the help of generous donors and more than 25,000 volunteers, Make-A-Wish grants a wish somewhere in the country every 38 minutes. It has granted more than 226,000 wishes since its inception in 1980; more than 14,000 in 2013 alone. Visit Make-A-Wish to learn more. To honor the millions of children whose clothes are kept bright and clean each year using Purex detergent, the Purex brand is teaming up with Make-A-Wish to bring bright wishes to children with life-threatening medical conditions. Purex will pay 5 cents per bottle of laundry detergent to Make-A-Wish for the first 4 million bottles of 75oz (or larger) liquid detergent sold from February 1st through February 28th of 2014, and will increase payment to 10 cents for every bottle above 4 million, with a minimum guarantee of $200,000 up to a maximum or $300,000. Purex will pay 8 cents per bottle of fabric softener to Make-A-Wish for the first 620,000 bottles of Classic and Ultra Lines in Mountain Breeze and Sweet Lavendar fabric softeners sold from February 1st through February 28th of 2014, and will increase payment to 10 cents for every bottle above 620,000, with a minimum guarantee of $50,000 up to a maximum of $100,000. Be sure to stock up on Purex Laundry Detergent during the month of February as every bottle helps this effort to support a great cause. Learn more at www.purex.com/make-a-wish. Our family has been long-time lovers of Purex laundry detergents and fabric softeners. From work clothes, to baby clothes, and even cloth diapers, Purex has always worked for us. I'm so happy because not only is Purex supporting a great cause, but they are offering a giveaway too! One lucky reader of mine will receive a coupon good for one free bottle of Purex Mountain Breeze detergent. Leave a comment below telling me if you've ever tried Purex detergent before, or why you'd like to give it a try. Be sure to leave your email address in your comment so I can contact you if you win! For extra entries, come back daily and share this post, and leave the permalink in a comment. Giveaway will close on 2/19 to ensure you receive your coupon by the end of the month and can support Make-A-Wish with your purchase. Disclaimer: Baby and the Chi's blog received the product(s) mentioned in this post for the purpose of review and evaluation. No monetary compensation was received. All opinions expressed in this post are 100% my own. This post may contain affiliate links.Baby and the Chi's cannot be held responsible for prize(s) lost during shipment. Giveaway is open to US residents age 18+ only. I'm always on the hunt for a new body wash that is moisturizing enough to really give me soft skin. I was so excited when Dial sent me a bottle of their NEW Vitamin Boot Body Wash to try through the Purex Insiders program. Dial Vitamin Boot is lotion infused, contains a unique vitamin b complex, and leaves your skin healthy and soft. I couldn't wait to give it a try! We have very hard water here in our region of MN. That, teamed up with this nightmare of a beastly cold winter, has wreaked havoc on my skin. I feel so itchy all the time from being so dry, and the 20-something different new body washes I've tried over the past few months (don't worry, most of them were sample sized...) have made little to no difference in the feeling I get when my skin is so dry it has almost no stretch. Dial Vitamin Boost Body Wash has been a life- errr... SKIN-saver. After one use the amount of moisture left in my skin after showering was incredible. It reminded me of how my skin usually felt after using other body washes then using lotion after. It felt that good! I'm so excited to have this new Dial product as part of my daily routine. I loved this product so much, I'd like to share it with you! Purex and Dial have provided me with an opportunity to share additional product with you in the form of coupons! One lucky reader will get a chance at winning one coupon good for their own FREE bottle of Purex Vitamin Boost Body Wash. 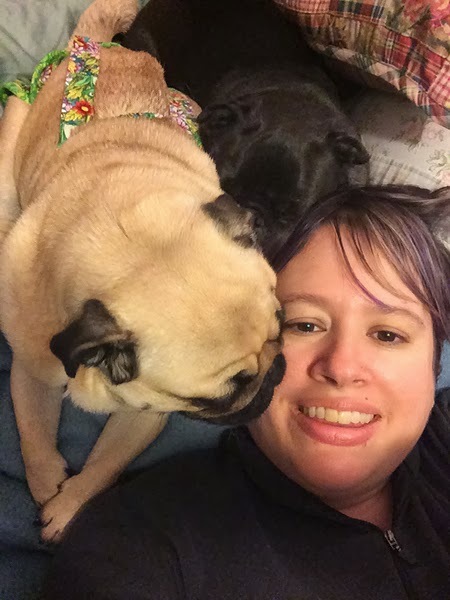 I am a writer, teacher, and owner of two pugs: Alfie and Waffles. As such words and dogs figure prominently in my day. I set the rhythm of my life around my dogs—when they go in, when they go out, what time they wake, and what time they sleep. Their daily activities are a more faithful reminder of my schedule than any alarm clock. Yesterday, I interviewed a fellow dog lover for an article I am writing. She mentioned, in what has almost become cliché language, that her pets are like her children. I know another writer who balks at such a suggestion—pets are not our children, he warns. They are different creatures, unique from us, and we do them a disservice when we compare them to human offspring. We should not infantilize or anthropomorphize them, he warns. The disservice to me is one of language. The word “pet” no longer serves the function that animals, especially our dogs, play in our lives. They have come in from the doghouse, backyard and chain, and share our beds, sofas, and homes. Creatures of metaphor, the closest we humans seem to come in describing the interdependence between our pets and ourselves is the parent/child relationship. “They are family,” we sometimes also say, illustrating again how integral our dogs are in our lives, suggesting a level of loyalty and fidelity we feel for them. We cannot imagine our lives without Spot or Fido, in my case, Alfie or Waffles. This is often an issue a writer faces. When it comes to the big stuff—important concepts such as death and freedom and of course, love—words often seem inadequate, so we resort to the tools of the poets: “Shall I compare thee to a summer’s day….” We turn to metaphor and thus, we describe our pets to the closest similar relationships we can find: children or family members. They are important is all we are trying to say. They mean something to us. They figure in our lives. They fill a place in our hearts. I do not have children of my own. I have nieces and nephews and my relationship with them is indeed, different from that of my dogs. But, like children, my dogs look to me for the important things like food, shelter and play. I figure in their lives as predominantly as they figure in mine, maybe even more so. We are indeed interdependent. Perhaps we need better words than child, family member or pet to describe what our canine companions have come to mean to us. Then again, perhaps this truly is only an issue of semantics, a disservice only theoretical in nature. For when I sit curled up at night with Alfie and Waffles on my lap or at my feet, I do not need new words to describe what I feel nor does any pet owner. We know exactly what our pets mean to us. We know love when we see it. A special thank-you to Samantha for allowing me to share on her blog. 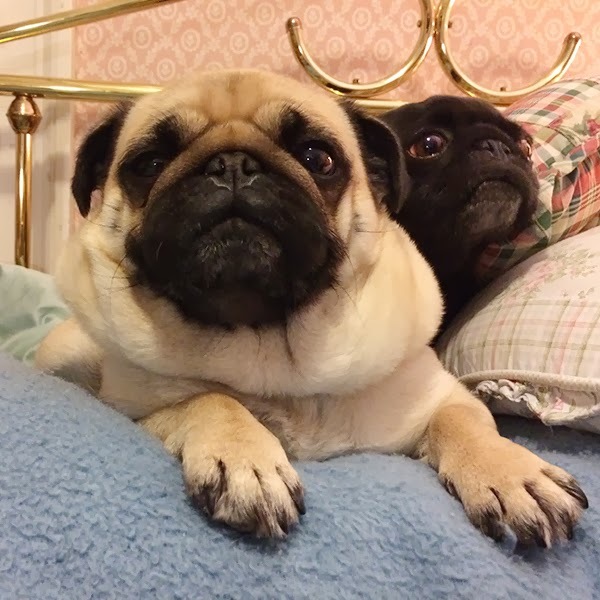 To read more of my work and check out my daily adventures with my pugs Alfie and Waffles, please check out my blog Pugs & Pics (www.pugsandpics.com). Sorry for the outrageous delay with January's BarkBox review, it's been a heck of a past few weeks! Very colorful and has a squeaker. Venus has claimed this as her own and will not allow it to be taken out of her bed. 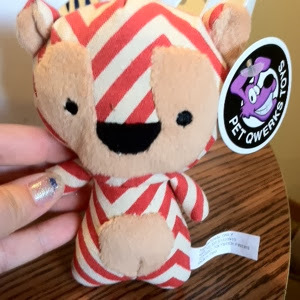 I'm seeing this valued at roughly $7 by other BarkBox recipients, though I cannot actually find it for sale online, leading me to believe that it's a BarkBox exclusive item. 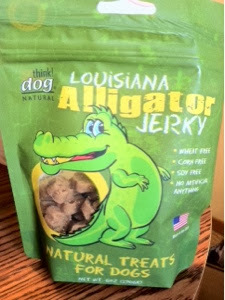 These made me laugh a little, until a realized they were made from real alligator. Then I had to let the girls try them right away. These are perfect for tiny pups, and are also great for dogs with allergies to more common proteins. Average price per package is $7. Great for chewers, teethers, retreivers, and more. 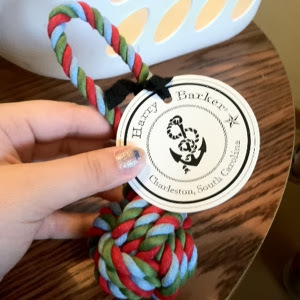 Very brightly colored, and softer than other rope toys I've bought in the past. Made from AZO-free dye on cotton, and is machine washable! Comes in three different sizes and a variety of colors. Average price on these is about $6-$10 depending on size. A special blend of deer meat and rawhide, keeps your dogs teeth and gums clean. Venus loved this! Priced at roughly $2 a stick. You can enjoy the fun goodies with your dog too! 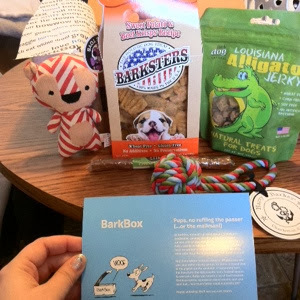 BarkBox offers three subscription lengths in three different sizes. Small and cute ranges from 0-20 pounds, Just Right ranges from 20-50 pounds, and Big & Bold is for dogs 50 pounds and up. You can be billed monthly for $29 a month, every three months for $24 a month ($72 every three months), or every six months for $19 a month ($114 billed every six months). Or use coupon code NCXCSBZWX7 at checkout.